At Marquis Dental Group in downtown Saskatoon, our dentists can help enhance your smile with professional teeth whitening services. Teeth whitening is a simple, non-invasive dental cosmetic service used to change the colour of natural tooth enamel. Why would I get my teeth whitened? People typically have their teeth whitened to improve their appearance however, many business professionals also report that it goes a long way to improving their effectiveness professionally. When people have a brighter smile, they tend to smile more often and are less self-conscious. Having whiter teeth has now become the number one aesthetic concern of most patients. There are a number of ways to whiten teeth. The most popular method is using a home teeth whitening system that will whiten teeth dramatically. Since teeth whitening only works on natural tooth enamel, it is important to evaluate replacement of any old fillings, crowns, etc. Replacement of any restorations could be done after bleaching so they will match the newly whitened teeth. When might I need teeth whitening? 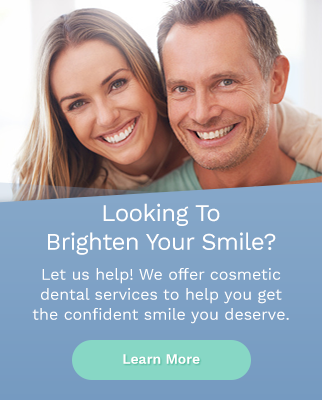 What can I expect after my whitening appointment? You will receive care instructions for your teeth and trays, and be encouraged to visit your dentist regularly to help maintain your smile. Teeth whitening is not permanent. A touch-up maybe needed every several years, and more often if you smoke, drink coffee, tea or wine.